The folk(s) at ReDiscovery must really love Dvořák's Eighth Symphony. In addition to the present release, they also offer a CD-R containing not one but two recordings of this symphony: one with Charles Mackerras and the Hamburg Philharmonic Orchestra, and the other with Jonel Perlea and the Bamberg Symphony Orchestra (RD087). Who can blame them? This is a beloved work in which the composer's genial spirit is at its most refined. Thor Johnson (1913-1975) became music director of the Cincinnati Symphony Orchestra in 1947, which made him, at the time, the youngest music director of a major American orchestra. (Prior to that, he had served in the United States Army.) In the early 1950s, Johnson and the Cincinnati SO made a trio of recordings for English Decca, and then were signed to Remington, for whom they made seven more. The Dvořák was the first of these, and the two works by Sibelius were the last. Despite the early date and the fact that Remington issued the LPs monaurally, they were recorded in stereo, and that is how they are presented here. 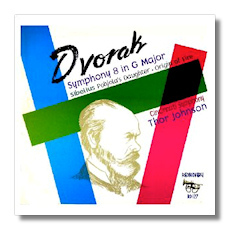 Johnson makes the Dvořák sound like Schumann – not necessarily a bad thing. The Slavonic element is not overplayed, and on the whole, the whole symphony seems to have been pulled to the west. Even the third movement is given a salon-like smoothness which is not quite what we have come to expect today. I liked it anyway. Johnson gets fine playing from the orchestra, and the brass are encouraged to play out. (Fortunately, Cincinnati had a good brass section during this period.) This Eighth is neither particularly Czech nor truly outstanding, but it is always interesting and different, and it preserves the work of a worthy American conductor whose work is not remembered much today. Johnson visited Sibelius in Finland in 1951, after receiving an invitation from the composer's eldest daughter. In November 1953, the Helsinki University Choir visited Cincinnati, and this recording of The Origin of Fire was the result. This nine-minute cantata was a novelty at the time, and in fact, still is, so it is too bad that a text and translation could not be included. For most of the work, the baritone has the spotlight, and Sulo Saarits rises to the occasion. His masculine, no-nonsense style is just right for the composer's declamatory writing. Late in the work, the chorus enters, and even though they seem to have been recorded in a slightly different acoustic (probably an artifact of microphone placement), they bring the work to a rousingly effective conclusion. (ReDiscovery also released this recording as part of RD103.) The relatively well-known Pohjola's Daughter receives a straightforward, almost prosaic reading from Johnson. Again, local color is downplayed, and even though the overall effect is a trifle unsubtle, this is an enjoyable recording. The very early stereophonic sound is warm and impactful. Sometimes perspectives are odd and the amount of detail is not ideal, but this is very listenable anyway. There are traces of surface noise in The Origin of Fire; they should not bother anyone. ReDiscovery CD-Rs are available for $15 from www.rediscovery.us.